You are currently browsing the tag archive for the ‘royal show’ tag. On Friday I went to the Royal Show; not a show I would generally choose to go to. Once a showcase for some of the best examples of British livestock and businesses in the industry, now prohibitive costs and soaring overheads have taken it out of the reach of most exhibitors leaving it to corporate bodies, supermarkets and ubiquitous market stalls to fly the flag. But I was going for a reason. 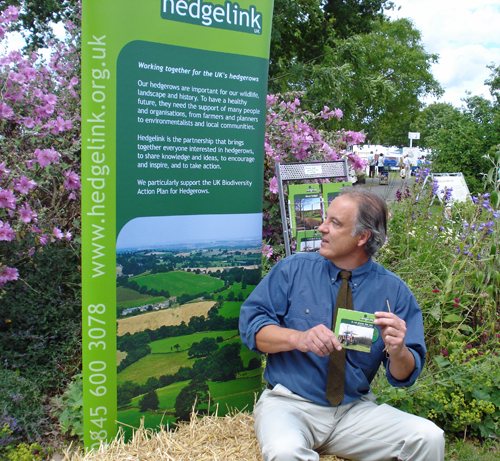 It was the launch of Hedgelink, a partnership of organisations and individuals leading and supporting the conservation of the UK’s hedgerows, and a project that Robert has been closely involved in over the years and one he’s passionate about. Prince Charles was going to be at the launch. Robert had asked me to go along with him. We left the farm at the crack of dawn and had a happily uneventful drive up to Stoneleigh, the Royal showground. The day was perfect too. No rain, just sun and clouds with a breeze. The launch was taking place on the Natural England site which is an impressive acre or so of various ponds and plots giving examples in how to encourage wildlife and diversity on farmland and in your garden. The whole was a serene, peaceful green oasis in an otherwise confusing array of stalls and roads. Leaving Robert to fluster and muster I went off to do a reccy of the showground and inadvertently became caught up in the Prince’s and Duchess’s arrival! 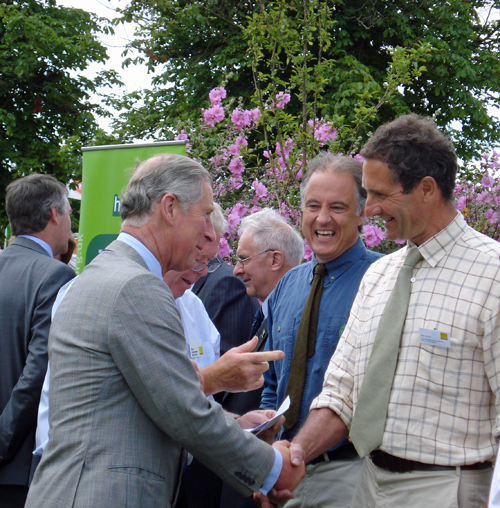 I duly shook hands and murmured complete nonsense while being once again taken aback by Charles’s approachability and the genuine interest he shows when talking to people. 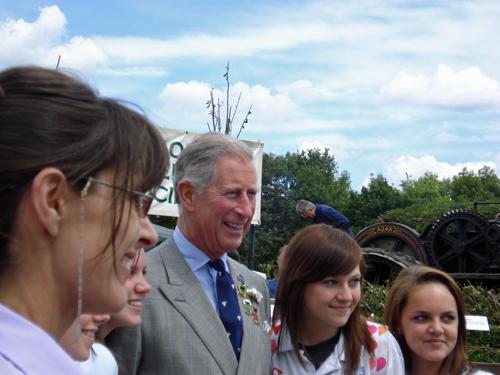 Prince Charles with a group of very happy schoolgirls – they were chuffed! I’ve had contact with the prince before. It was nearing the end of the 2001 FMD outbreak when a small group of us were invited to have tea with him on one of his supportive visits to a devastated West Country. He had apparently followed all my weekly TV video reporting on Countryfile; knew intimate details of my stock and farm; displayed real understanding of the trials and tribulations I and others had been through. In other words he cared, and there was no indication of doing lip service. I like that, a good egg. Back to Friday. The launch was due at 1pm. 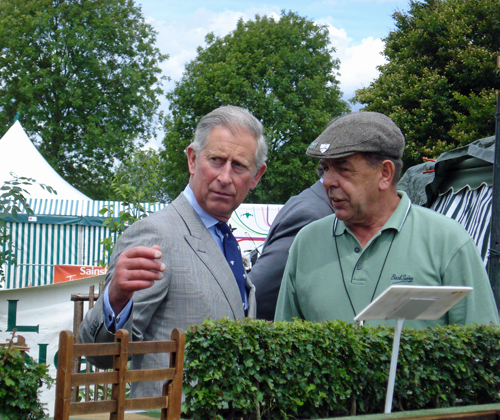 Robert was beginning to show signs of stress when a steward appeared and announced the Prince would be there in a few minutes as he was running well ahead of schedule. The place was immediately seething with a plethora of paparazzi and a surge of people. The line-up had only just organised itself when the prince and his entourage arrived. Feeling small and insignificant with my diminutive camera against a bank of monstrous super-zoomed beasts handled by hardened push-hardest-and-shove journos I was startled when I found myself being asked by his personal aide if I’d like to stand practically next to the price to take my photos! It was a great success. Hands were vigorously shaken; smiles were stretched across faces in wallace & gromit-like proportions; Prince Charles grinned and crinkled, spending a good time with each member of the team discussing the work they had done in creating Hedgelink and the DVD ‘A cut above the rest’. He’s an avid supporter of the hedgerows in our countryside and went away clutching his copy of the DVD. Having just watched the DVD. I can honestly recommend it to any of you that have even a tiny interest in hedges. It’s beautifully filmed and presented. The clear, practical information is easy to follow and holds your attention to the end. Even though I have a fair knowledge of hedgerows gleaned from Robert I found there’s lots which will make me look at hedges and hedgerow trees in a new light. To see excerpts of the DVD follow the link and also to order your free copy.